Characteristics: Tempered glazing, 10mm in thickness or 5+5 for laminated tempered glazing, usage of parking, aluminum frame, insulation using brushes. Basic dimensions: Lower and upper horizontal profiles 60mm, aluminum rail driver 60x53mm in size, total intermediate vertical frame thickness 38mm. 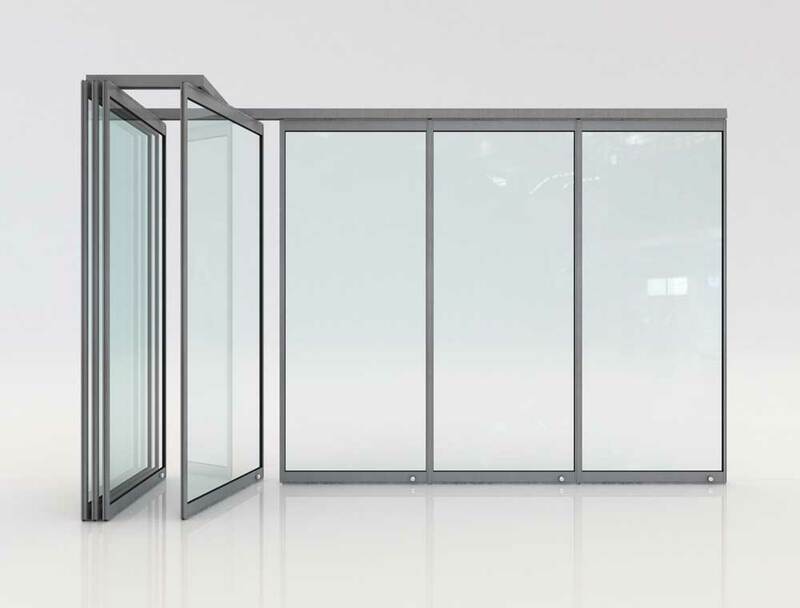 The F5 glass folding door system is the smartest choice to make when single glazing is desirable, and at the same time an aluminum frame is required, either for aesthetic reasons or additional insulation and durability. The vertical parts of the system are coupled together with male and female cross-sections, while also bearing elastic gaskets in order to achieve a satisfactory thermally insulative result. Every pane is secured at the bottom part with a latch whose nest lies on the floor. Additionally, every pane can operate as an entrance door – independently of its position – by using an extra mechanism embedded at the top of the pane. If required, one more accessory for the entrance pane to fold back smoothly can be added. The F5 system uses only the light-type 60x53(mm) rail driver, while pane sizes can reach up to 100 in width and 280cmn in height (maximum pane weight at 85kg). The glazing used is 10mm tempered or 5+5 laminated tempered. The discreet, elegant impression of the F5 system make it an excellent choice for shop fronts, perimeter enclosures for patios, office space, bars, restaurants, hotels and more. Design flexibility: Absolute flexibility regarding the placement and modification of the parking area, as well as the number and size of the folding panes. Aesthetic value: The F5 glass door system is characterized by truly elegant design and minimalistic aesthetic. Low cost: The simple, thin aluminum profiles which the F5 system uses, contributes to a lower construction cost.